Our weekly produce box has been so good for rounding out our meals – veggies galore! 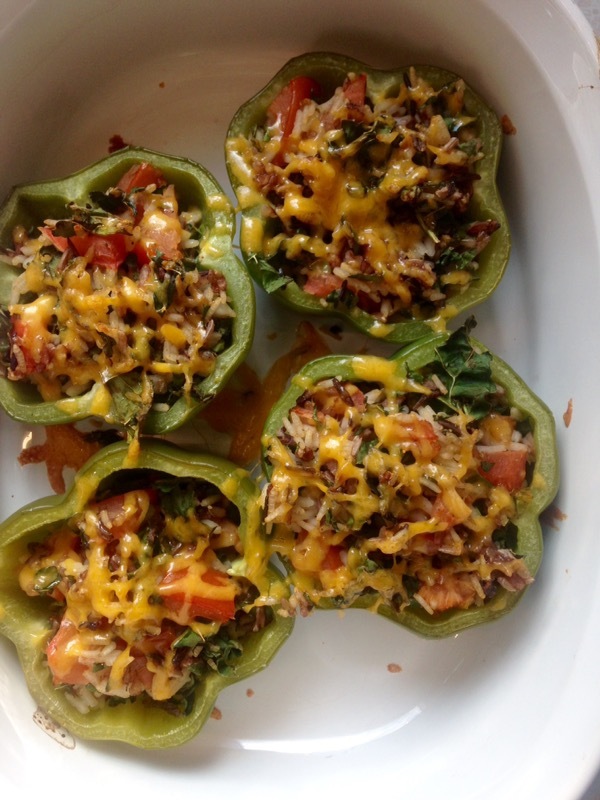 I decided to make stuffed peppers last week, something I have not made in ages. As almost always, I winged it. 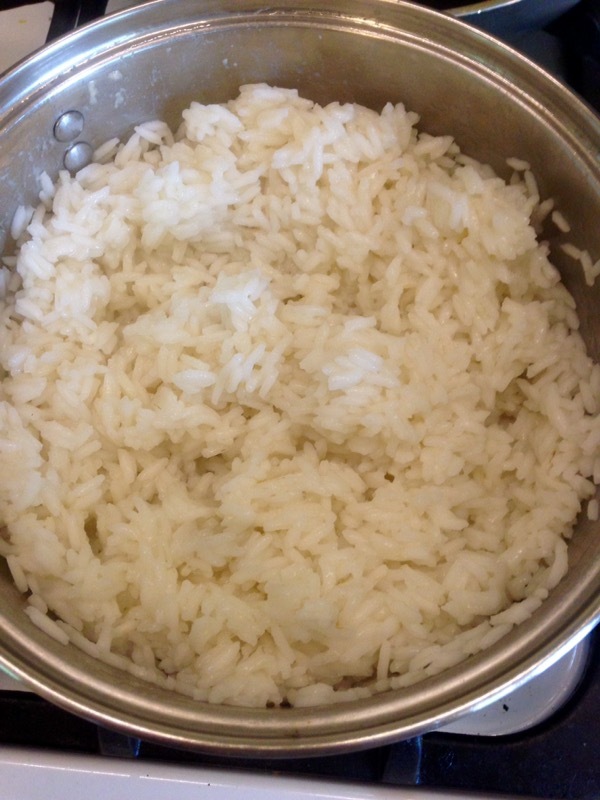 I made a big pot of rice, with the intent of the leftovers being turned into fried rice on another night. Win for me and easy weeknight dinner! I’m an absolute sucker for any sort of Tex-Mex flavoring, so I went with a pre-mixed Mexican spice for flavoring this time. I arranged my 2 halved peppers in a casserole dish and began filling, hoping I had just the right amount of rice mixture. Somehow, my eyeballing skills haven’t failed me yet! Just before I took them out of the oven, each pepper received a delicate sprinkling of cheese. Delicious reheated as a weekday work lunch, too, I might add. 1. 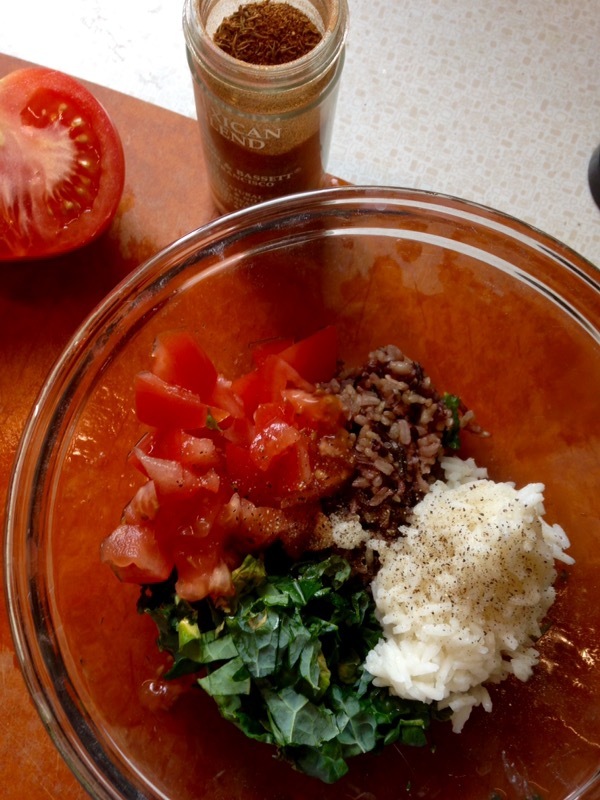 Combine: ½ cup cooked white rice, ½ cup cooked mixed rice, 1 cup chopped kale, ½ chopped tomato, 1-2 tablespoons lime juice, salt & pepper, Mexican seasoning. 2. 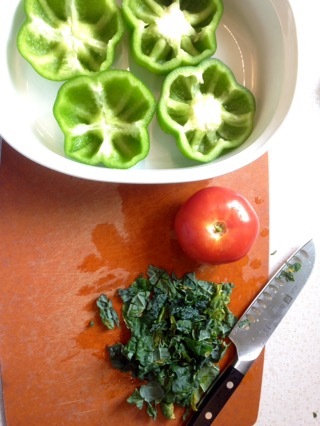 Cut 2 bell peppers in half, horizontally. Remove seeds and ribs. Fill with rice mixture. 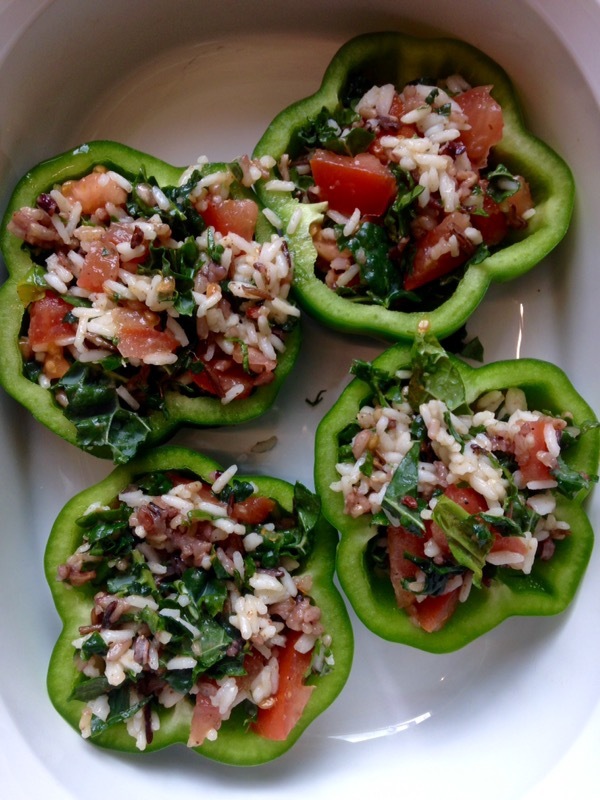 Bake in 375° oven for 30-35 minutes or till peppers are slightly softened and rice lightly browned. Optional: add sprinkling of cheese on top during last 5 minutes of baking. One of the things I missed most about the Midwest was its unique plants – moving to North Carolina made me realize that I couldn’t smell lilacs every spring, watch the corn grow into tall tasseled plants, and wouldn’t be enjoying freshly cut rhubarb desserts. Of course, moving back to the Midwest has made me miss uniquely southern plants as well – the looming ancient magnolias and their white messy blooms, the grape-like bunches of sweet-smelling wisteria, the browning fields of tobacco plants, dots of white dogwood in the understory of the forests, the creeping cathedral-like kudzu that took over the countryside. What are your favorite plants? Are they tied to a location, particular time, or memory? I often make rhubarb strawberry desserts, as the sweet strawberries complement the tangy and tart rhubarb so nicely. However, I did not have strawberries on hand, and thus used a carton of raspberries instead. To me, rhubarb looks like reddish-green stalks of celery. The leaves are full and scalloped and also happen to be poisonous. Their blooms are fascinating bunches of flowers and they happen to prefer cooler climates. I kept this dessert on the sour side, by swapping refined white sugar for coconut sugar. It’s not as sweet in flavor, but remember, sugar is still sugar. In a 8×8′ baking dish combine: 2 large stalks of rhubarb, sliced and 6 oz of red raspberries (or more is fine too, this is just what I had on hand). In a small bowl combine: 3/4 cup whole wheat flour, 1/2 teaspoon of baking powder, 1/2 cup coconut sugar, 1/4 teaspoon ground cinnamon, 1/4 teaspoon ground cardamom, 1 cup oats, and 8 tablespoons of cold butter. Combine with hands until mixture is sticky and butter is completely combined. Bake in a 350° oven for 35-40 minutes or till fruit is bubbly and top is lightly browned. I love a solid baking or cooking challenge – veganizing and freeing of gluten are two that I do frequently. With food allergies and diet preferences abundant in my circles, I have come to embrace this style of preparing food. I made these during the month of crazy-busy April. I wrapped up a grad class, an art class, a presentation at work, and working on some other big changes all in one month. I made time for some fun around Eric’s birthday weekend though. We got together with some friends to grill out one evening, and I brought these lovelies along for dessert. The swapping of a few ingredients made them no less delectable, I promise! To make these vegan, I swapped out butter for coconut oil and chia seeds for eggs. I decided that while I was it, I may as well swap out the brown sugar for coconut sugar. It made them a little less sweet tasting but kept the chewy goodness. This is the fantastic meal prepared by our friend, Ben, which preceeded the dessert. I’m drooling just looking at this image – please start a food blog! Q proceeded to work on his tag – making these diagonal pink lines all over the sidewalk, steps, hose, himself… Yup, those are my wedding shoes, they are still going strong. More on the rest of April later – I have been busy creating, just not posting/sharing busy. In a small bowl combine: 2 tablespoons chia seed with 6 tablespoons water. Stir and allow to sit for 30 minutes to an hour or till thickened and gel-like. Grease 13x9x2 inch baking pan with dairy-free shortening. Microwave 2 cups coconut sugar and 2/3 cup coconut oil until oil is melted. Stir until mixture is smooth. Cool slightly. Combine with chia seed and water mixture and 2 teaspoons vanilla. Stir in 2 cups all-purpose flour (or 2 cups Cup 4 Cup mix, for gluten-free option! ), 1/4 teaspoon baking soda, and 1 teaspoon baking powder. Mix in 1 cup semi-sweet, vegan chocolate chips. Spread batter into prepared pan. Bake in a 350° oven for 25-30 minutes or till a knife inserted near the center comes out clean. Cool slightly. Cut into bars while still warm.